Imagine connecting with your parishioners and supporters through the power of a native mobile app. Imagine Catholic prayers, Catholic faith resources, and all of your parish news and information packaged into one little button. Then, imagine this little button on the home screens of those parishioners' phones and tablets. No need to enter a long domain name: Everything your parishioners need is consolidated into one beautiful app button. Finally, imagine sending a push notification to everyone who has the app. You'll soon wonder how you ever survived without one. A Real, Branded, and Customized App for Your Parish. When your parishioners download the app we build for you, they will see you parish name and images in the app store. The App icon button on the phone, the name underneath the icon, and all app branding will pertain to your parish. You wont be "sharing" an app with other churches. Messages sent by you directly to the user’s phone or tablet. Push Notifications offer an unheard of means of communication. User remains anonymous so push notification offers an ability to reach non-registered or difficult to contact parishioners. Push Notifications may be sent to specific groups of users such as KofC, Bible Study, Youth Group, etc. Push notifications can also be sent to all users. See how parishes are using push notifications here. Easy and powerful back - end editor which allows you to add, remove, edit, and re-order app pages. Make pages inactive until you need them again next year. Add sign up forms and link to existing online resources. Embed website pages to simplify your updating procedures. Back-end Editor is entirely web browser based, which means you don't need any special software. Update from anywhere and anytime. The schedule page is a simple page listing your regular sacrament schedule and other regular activities such as Eucharistic Adoration and Bible Studies. A map page showing the exact location of your church. Users can push a button to activate GPS directions. They can also press a button to e-mail or call your church. A link to your most recent bulletin or to a website page where your bulletins are archived. Collect donations right through the app. Use our super easy and simple one page donation form or connect the app to your existing donation system. Either way, the app makes it easy for members to make donations to your church. Social Media pages look great when integrated with our app. YouTube, Facebook, Twitter, Pinterest, Blogs, LinkedIn, Hosted Podcasts, iTunes, and any other website based social media site can be opened inside our app. The user will not be redirected to the browser but will remain inside the app. Content, photos, and contact information for your ministries. A notepad tool for taking notes during talks, conferences, prayer time, and homilies. Notes are saved to the user’s phone and can be deleted by the user. Tired of remembering to take photos at events? Now every parishioner can help you document events by using the built in capture feature. Right from the app, users can snap a photo and email it to a staff member. This features makes it easy to build a parish photo gallery. Show off your parish’s active life and ministry. Upload photos or automatically grab them from popular photo sharing sites. The Rewards features is a virtual punch card. Users present their phone to the group moderator, such as a Bible study leader, and the leader enters a secret code which “punches” the virtual punch card. Give out rewards when a user fills in his/her punch card to make this feature really fun and interactive. Unlimited cards can be created for various parish activities. Info pages are pages in which you can directly type in content and add images. Add as many additional info pages as you would like. Website link pages allow you to seamlessly embed external websites into the app. The possibilities are endless with this feature. Up to five images which rotate on the home screen. This is a real app branded and made for your parish. Your parish name will appear in the App Store, on the App Icon, and in the app. Your parishioners will download your app and be presented directly with our content. Catholic Talk Radio can be embedded into the app anywhere you want or in the Pray or Learn sections. You can connect the mobile app to our Form Builder tool, which can create multiple page forms, accept payments, and utilize form logic. You can use Form Builder for simple forms, complex forms, donations, and payments. You can create a directory listing of people and/or places. You can also easily link to or embed an existing parish directory into the app. A QR Code scanner is an available feature which is included with all of our mobile apps. You can add points of interest to a map and color categorize the points of interest. An included voice recording feature allows you to record audio files. Offer rewards for attending events of completing tasks. 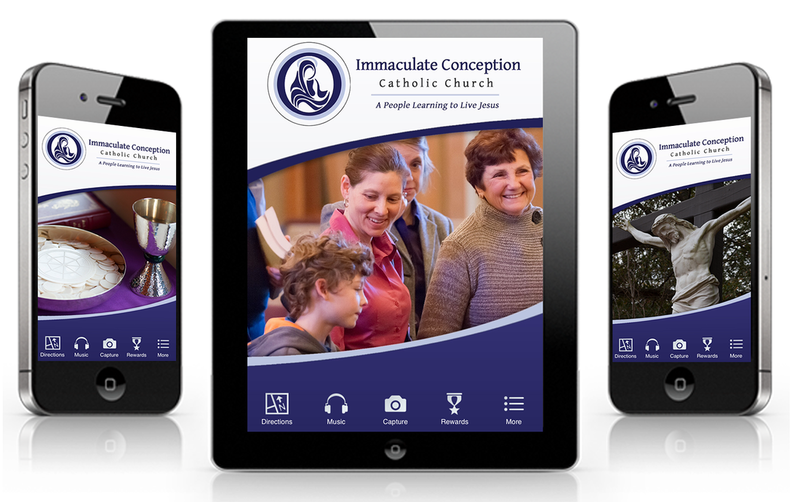 End User Tour: Take a tour of a Parish Mobile App to learn about all of the great features. Admin Tour: See how easy it is to update your mobile app and send push notifications. National Shrine Grotto at Mt. St. Mary's Univ. One of our parishioners sent this e-mail which we are putting in the bulletin this weekend:"Dear Father, What a wonderful Christmas present. Thank you. Thank you. So much information and opportunity for reflection and prayer. Nice to have The Lord on my iPad. Merry. Christmas." This is fantastic! I’ve already been playing with the editor and love it. I've downloaded it and it looks great!! !